Publication and its attendant excitements have taken up much of the past month, and I have a stack of punctuation-related matters to catch up with. Without further ado, let’s get on with the show! 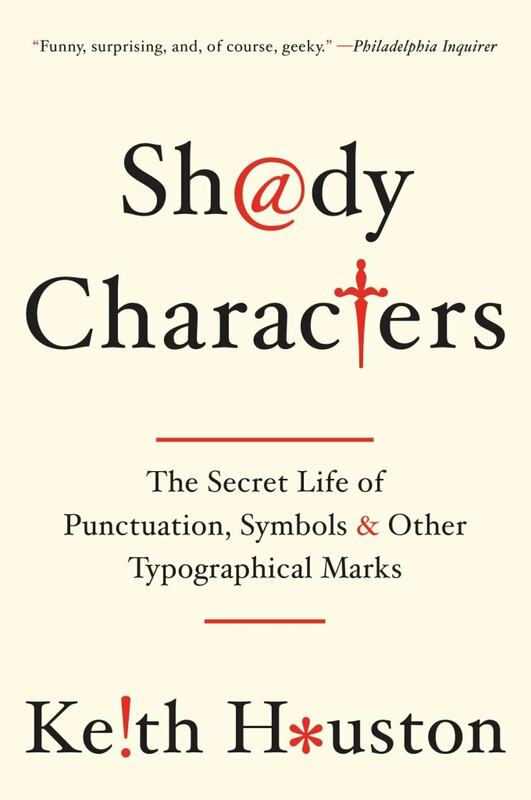 Readers of Shady Characters (whether in book or blog form) will recall that the octothorpe (#) came by its rather esoteric name courtesy of the creation, in the 1950s, of the push-button telephone keypad. The engineers of Bell Labs had designed a 4 x 4 grid of buttons where each row and column was assigned a unique audible frequency; when pressed, a button produced a tone composed of the frequencies corresponding to its location on the grid. Early production handsets had only ten buttons — the digits 0–9, arranged in the familiar inverse-calculator layout — while later versions added ‘*’ and ‘#’ buttons to yield a neat 3 x 4 grid. (Military and other speciality handsets used all four columns.) The story, as told by two separate Bell Labs employees, goes that there was no unambiguous name for the ‘#’ and so, for the purposes of training and documentation, it was necessary to invent one: “octothorpe” was the result, and its place on the soon-to-be ubiquitous telephone keypad assured its survival into the future. 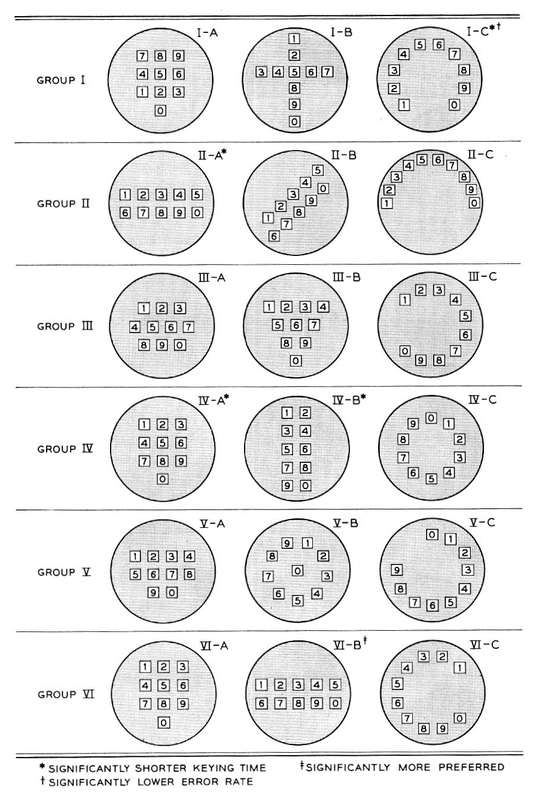 Proposed telephone keypad layouts, as described by R. L. Deininger in Human Factors Engineering Studies of the Design and Use of Pushbutton Telephone Sets. Five layouts were chosen as being especially promising in terms of speed, accuracy, and preference among the test cohorts: IV-A (“three-by-three plus one”); II-A (two horizontal rows); IV-B (two vertical columns); VI-C (“telephone”), and I-C (“speedometer”). Of these, the grid-like “three-by-three plus one” layout was selected for further study by dint of possessing “certain engineering advantages”; though Deininger does not spell it out, those advantages must surely have boiled down to simplicity with which its buttons could be made to actuate the oscillators that generated their characteristic tones. What I find intriguing about all this is that the ‘*’ and ‘#’, the auxiliary keys that we now take for granted on our telephone keypads, are utterly absent from this otherwise comprehensive experiment. Where would they have ended up if, say, the “speedometer” or “telephone” layout had been selected? Would the number keys now be found orbiting the “little star” of the asterisk, held in place by the gravity of the pound sign? Or would they have been relegated to the bottom of the telephone like an especially terse, cryptic footnote? For more on this story, head over to the Numberphile YouTube channel for their illuminating video on Bell Labs’ work on telephone keypad layouts. As a bonus, listen out for a particularly entertaining anecdote about how the head of their Human Factors department settled on the minimum acceptable length of telephone cords. It’s well worth watching! In a happy coincidence, Conrad Altmann, a long-time friend of this blog, has posted a stylish new interrobang T-shirt for your consideration on Cotton Bureau. If you’d like to help Conrad see his shirt printed, head over there to reserve one for yourself. Nice and informative. I have been around Bell & AT&T employees for as long as I can remember and none really knew the why of how the touch tone keypad was developed. I have always had (although I grew up with dial) a touch tone phone because the tones can be used for a myriad of control of remote devices. I would surely welcome wide spread use of the interrobang. I have stated for years I wish we had a way to exclaim a question with a punctuation mark. I use ?! or !? Until I found your blog I never knew the interrobang existed. I for one wish it were never removed from the typewriter. I have several old Remingtons yet none have the interrobang. Then I do not own a Royal Vogue (yet) either. I’m amazed by the amount of work that went into developing the Touch-Tone keypad, but perhaps I shouldn’t be; AT&T / Bell Labs were clearly aware of their place in society and how pervasive their products and services were throughout it. As Przemysław mentions below, their design is now so ubiquitous that it’s a surprise to come across a keypad that doesn’t use it! The interrobang key was actually an optional extra for Remington Rand and, separately, Smith Corona typewriters, so it required a deliberate choice on the part of a typist to obtain and use an interrobang. I’d dearly love to find one of the interrobang key kits, or even a typewriter with one installed. I had exactly the same problem in Spain! It was a bit of an epiphany to realise that I remembered the pattern far more readily than the number itself. “Inverting” my PIN to work on the calculator layout was far more difficult than it should have been! It would be interesting to explore the history of when and why the number-pad layout diverged from the original telephone layout, and if it was the telephone layout in America that other countries based the designs of their own on. Perhaps Spain and others did the same study as above, but for some cultural reason, had the asterisks and daggers on different options. Hi Conrad — no problem at all. The development of international telephone/calculator/ATM keypads would be an interesting bit of research! Any Shady Characters readers care to take up the challenge? I read (I forget where) that the reason was actually quite a sexist one. In essence, the 789456123 Numpad layout comes from the tradition of early adding machines, where the numbers 0 to 9 were arranged vertically, with 9 at the top, repeated for however many digits the device handled. This evolved with the new technology into the modern numpad one. Thus, calculating machines employing this layout were found in offices worldwide, operated by female secretaries. However, when the Bell engineers devised the telephone keypad, they realised that the predominant users of the telephone were the female secretarial staff at businesses. They therefore devised the telephone keypad to have a different layout to prevent the secretaries from getting confused between the machines, the implication being that the secretaries’ “pretty little heads” wouldn’t be able to handle it. The result was the difference that remains to this day. Good grief! If true, that’s quite something. 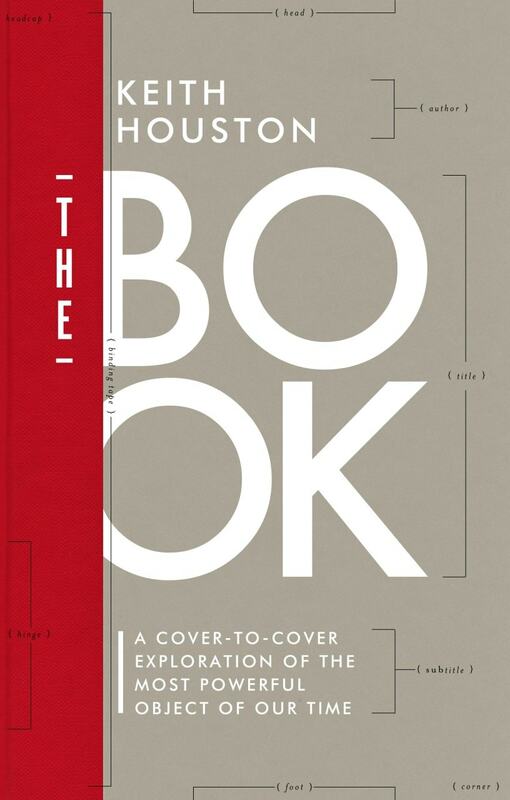 Do you remember at all where you might have read it? A quick Google search isn’t throwing anything up, unfortunately. I think it was on a calculator history site but I can’t remember, sorry. Ah well — thanks anyway! I’ll have a more thorough look when I get a spare moment. I found these theories on the how stuff works site: http://www.howstuffworks.com/question641.htm It posits a similar explanation, but not the identical one put forth by dheadshot. I remembered having written about this first time round, and a quick look back suggests that users preferred to keep the implied alphabetical order from rotary-dial phones, where 2 = ABC, 3 = DEF, and so on. Also, the journal paper quoted above says that the “telephone” ordering allowed slightly more rapid keying of numbers than the adding-machine ordering, even if the advantage was vanishingly small. When you consider that the 3 x 3 layouts were favoured for unspecified “engineering” reasons (for which I read: “the engineers already have a working 4 x 4 system, so let’s not rock the boat”), and that the rapidity of keying was effectively identical for both phone and adding-machine layouts, I find it easy to believe that Bell chose the former so as not to upset the millions of users who were used to translating mnemonic numbers such as 1-800-PAINTER onto their telephone dials. It seems very much as if the Human Factors department contrived to “pave the cowpaths”, choosing the layout — one which, coincidentally, was approximately as rapid and as accurate as any other — that would minimise disruption both internally and externally. A good call, I’d say! The pretty little heads story sounds like an urban myth. I don’t know how it was in Britain or elsewhere, but here in the States, before Area Codes, before Touch-Tone, nearly all telephone numbers had letters in them. For example, I grew up with the number NIghtingale 6-3377. You dialed the first two letters of the exchange name, NIghtingale. (I never, ever thought of it as 646-3377 – I had to look at a phone just now to write that.) AT&T wisely kept the alphabet in a sensible order. Sorry to quibble, but … alternative, not alternate. Thanks for an interesting diversion, though!! Always welcome to see your posts. Hi Damaris — I went back and forth on this. “Alternative” is obviously the more correct choice, but “alternate” appears to be the popular one. Henry Petroski does his usual thorough examination of telephone keypad layouts and how they got that way in “Human Factors”, _American Scientist_ v88n4 July-August 2000, pp304-408. Hi Brent — thanks for the link! I’ve just skimmed the article and I’ll take a more leisurely look at it later. I find it interesting that Petroski doesn’t mention the “engineering advantages” put forward in the Bell article, though I think he must be hinting at them when he talks about the compromises made in order to come to final arrangement. I am speculating here, but the engineering advantages are extremely obvious to me, or anybody with electronics experience. With a grid pattern of buttons you can easily have vertical wires for each column, and horizontal wires for each row. That’s incredibly efficient for how to design and manufacture the keypads. With the circular, triangle, and other designs it takes more wiring. It might only save you a tenth of a cent per unit, but multiplied by hundreds of millions (and actually billions when you include other technology which copies the touch tone keypad) that’s a bunch of cash. Pressing “1” would result in the first row and first column getting selected, “4” would be the second row with the first column, etc. Each keypress generates two tones, low and high. So each press of a key in the first column (1, 4, 7, *) generates a 1209 Hz. tone. The second column (2, 5, 8, 0) generates 1336 Hz. and so forth. This way just 7 tones (three columns + four rows) can generate 12 possible numbers. With extended 16 character touch tone pads 8 tones decode to 16 numbers. I’d be inclined to agree with you. The two-tone system had been designed to minimise “cross talk” — that is, the problem of mistaking the sound of a human voice for a dialling tone — and I suspect that cost-conscious engineers plumped for a grid layout as the most expedient way to generate a pair of tones per button press. That the grid layout was among the best of the layouts when it came to user testing must have been a happy accident. AT&T could “pave the cowpaths” from an engineering perspective while keeping new adopters relatively happy at the same time.